First of all fog lights work great with new bulbs..Much better visibility. Finally got the carpet in..Looks great and much quieter.. Collecting parts for the exhaust..Muffler has a very slight leak. Maybe just from the drain hole. I picked up a knockoff Flowmaster 40 at the swap meet for $25.00. Then won an auction for a stainless Magnaflow cat and pipes. It's for a Dakota but it's close enough to work. I got it for $50.00. I'm planning on replacing the dual rear cats with the single Magnaflow. (original and Dakota are both 2.5"). Then put the Flowmaster on at the same time. Might as well do it all at once. I'm spending the extra bucks for stainless band clamps for a much cleaner job. I'm working on the flange and large oval in front of the two rear cats. I have the flange fabbed and got the 3" pipe today. Pipe is from an early 90's Silverado. I chose it because it has a 3" inlet and a 2.5" outlet. Just have to make sure I have the angle correct and flatten the 3" pipe. I'm going to replace all the O2 sensors when I do the exhaust. I want the new stuff all ready to install before I start cutting. I want as much of a simple swap as possible. Less down time. Did you use a sound deadening material on the floor and sides ? Just some aerosol undercoat / soundproofing. I wanted to get those stick on sheets but chose to spend the money elsewhere. Just the carpeting alone seems to absorb more sound than the mat did. The rug will do it but the sound material makes a big difference. Just some small sections need to done not the whole thing. It's looking good, keep it up ! I'm sure it does make a difference. It was a tough choice to not use it. Maybe later on I'll install it. What do you mean like the light one better? Paint won't wear off...painted my console a year ago. it still looks good. No on the square switches..I was looking for the rectangular bezels around the switches in the photos. The actual switch is the oval part. The rectangular surround is a removable bezel. 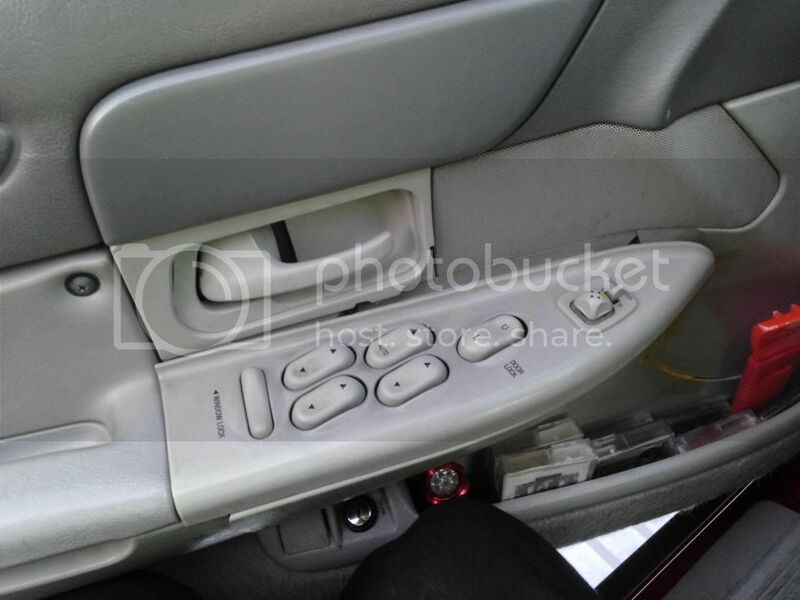 I remembered these pics when I towed a mid 90's Grand Marquis and noticed the door panels.... it had interior colored window switches, door locks, and mirror controls. This one was a two tone grey but I wonder if they had them in tan like your theme? I don't really know how well it will flow, like the photos above. I almost think you need some off color/contrasting color to take away from the blandness of all that tan. How about just the switch bezels being hydrodipped in the wood grain. The black plastic surrounding the switch itself. Similar to your shifter bezel around the boot and I believe your dash air vents? Just the right amount to break up the monotony. This could allow the use of either the painted switches or the black stock ones....whichever you see fits better. I'm all about these sort of things and I generally have ideas popping out of my head left and right no matter who's rig. Some friends say I'm really good at spending someone else's money! lol. I hope you don't mind my suggestions...I tend to think out loud sometimes. YouTube can get you some pretty good info on the process and even doing it yourself in the bathtub! Along with lots of videos showing how it's done. With such small pieces like those switch bezels, it's worth a shot! eBay and other retailers may have the film for purchase in single sheets. That's something I don't know though. I appreciate the ideas...I found the do it yourself kits. bookmarked it last night. 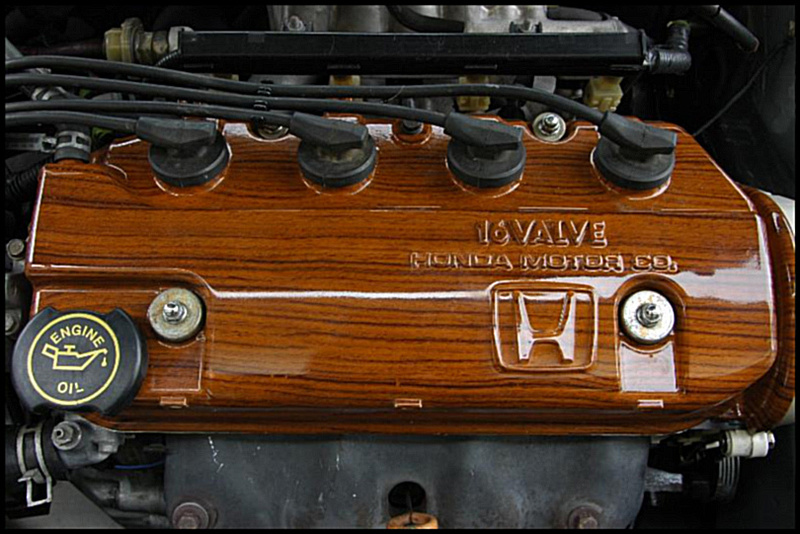 I'm not sure what I want to woodgrain. I'm thinking maybe just the flat part of the entire large bezel or just the individual switch bezels like you suggested. I need to think about it. I stuck one projector in to see how it fits and make sure they operate. I had a generic $5.00 relay harness. It worked but the quality was not to my standards(especially for headlights). I bought a used Morimoto controller harness for $10.00. It should be much better quality. It's in the mail. Maybe I will use the other relay harness for my upgraded fog lights. It will be plenty good enough for that. Repaired the harness and got it in. Got the ballasts mounted and tested everything. Pretty sure the controller is fubar. I tried all the combinations on the blue plug. Solenoids will not operate. Going to see if the pinout for the cheap controller is the same. If it is, I will try it in this harness. I may just put a couple cube relays in and be done. I mounted the driver headlight and it's aimed WAAAY too low. I may pull the inner silicone washer from the projector. I read somewhere that someone else had to do that. I don't want to go into a lot of details in the open forum. I purchased a lot of the projector parts from TRS (the retrofitsource) due to everyone's recommendation on the net. Let's just say that they have not lived up to the recommendations in my opinion. What is your set up? What projectors? I know those shrouds are not TRS and whatever is hanging off the back of the projector and that box is not TRS. Unless they're OE units I'm not familiar with. Went back 8 pages and all I've read is "purchased second hand TRS harness". All I'm saying is I've yet to hear a bad story about TRS. I've had 3 complete retro kits under my belt plus numerous orders for other parts here and there and not one issue. Ranger's are picky when it comes to their controller harness....my first one that came with my stage III kit wasn't compatible but their old style 9007 harness works great! And this has been confirmed by numerous Ranger retrofitters on other forums and even TRS is aware of it. The one with the big silver control box is not the one you want. I can't remember if Nick or Matt was the one to talk to about the correct harness. I'm not with my truck currently, but can update the thread with wiring info if needed when I am. The wiring was weird. I have found a couple others who ran into very similar situations with TRS that I did. I am not alone in my opinion. I am in the minority though. I don't believe the amount of someones purchase should make any difference in quality of service or quality of items being sold. I like to test the waters with a small purchase first. If a company treats me right, then I will make a large purchase. My 03 Ranger is the same as most vehicles. Negative ground and 1 positive for the high beam and 1 positive for the low beam. The newer Rangers are very different because they use a switched ground for the headlight switch. PS...You sort of proved my whole point. They are aware of issues with Ranger wiring yet no one posted that information on the TRS web site????? They go on selling the incorrect parts to Ranger owners without warning them????? I personally searched for 3 days before I started wiring this. The only info I found on TRS's own forum, hidplanet was to switch the 2 wires if your vehicle uses 9007 instead of a 9004. I am astounded that after searching for another whole weekend, I can't find a basic pin out for the controllers they sell. Basic information that I feel should be shared with the rest of the class.The colors of the wires are different on the 9007 plug. So which wire feeds the low beam and which is ground? These are all custom installations and wiring information is vital. The ballasts are OEM Matsus*ita. (Panasonic). The large metal thing on the rear of the bulb is the external ignitor. I wanted OEM quality ballasts. Got the wiring all sorted out. The Morimoto controller box worked sometimes but not all the time. I repaired all of the harness issues and tried the light duty plastic one and it worked. The wiring connector and pin outs are the same for the cheap black plastic control and the metal Morimoto controller. Test fired the headlights and checked the alignment. Had to make a small adjustment to the projector. I did not have the rear opening of the housing sanded level. Block sanded it level and all is well. Installed the butyl and resealed them today. Put some silver HVAC 500 degree RTV on the outer seam to insure a good seal. I will wait a couple days for the RTV to fully dry and I will do the final install. I'll post a few photos then. I need to finish the wiring for the heated mirrors and put in the green leds in the EATC. Well, finishing bench testing the EATC. I had to buy an actuator. You can't use an early actuator with a late style head unit. Tonight I finished modding in green led's in the EATC head unit. Please please please can you tell/show how you did the LEDs in the EATC! (If it isnt too much trouble) I heard it was nearly impossible to change the color of the EATC and you are the first person I have seen that has modded LEDs in there. Your build thread is amazing btw. Doing things no one else has tried. I respect that. First thing with the leds is you MUST use FORD bulb holders. The ebay ones will not work. I have standard mini leds in now. I am converting to SMD's The one's I got have the incorrect base for the EATC. What I did with the standard leds is the same as what I am planning for the SMD's. It's the same idea as the led mod for the headlight switch. You need to take the bulb out of the holder and put the leads for the leds in the same holes. The resistor has to go on the backside of the holder. Not much room so you have to keep things tight.